Whenever your company needs custom made solution that runs across iPad, iPhone, Windows, Mac and the web and is fast to deploy, Ineo can help you with FileMaker design and development services. We will help you in business process analyses phase, develop the optimal database structure , code and implement the FileMaker solution and support you in the every day application use. Contact us, our consultants are always ready to discuss your business needs and requirements. Using new features in Filmaker, Ineo can deliver complex integration solutions, like integration with internal or third party Web sites, integration with external databases or legacy business application. The integration examples include coupling of .NET applications with FileMaker, synchronization and exchange of data between FileMaker database and MySQL, Web services integration between FileMaker and third party sites, API integration, etc. You need to roll out your business to the mobile platform? 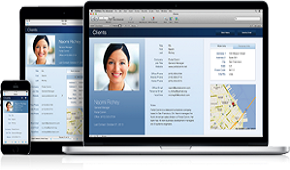 FileMaker can support by providing full application functionality on the iPhone or iPad. Your mobile workforce will have up to date application screens and functionality without having to install anything, as the application updates all the devices automatically. It is fast and convenient, cutting down the operational cost.